I was diagnosed with Lymphoma cancer in 2013 and have had several chemo treatments and radiation. I'm now going through cycles of 4 day, 24 hour chemo treatment preparing for bone marrow treatment soon. During all these treatments I have continued my fitness training to recover during and between treatments. I believe fitness plays an important role with recovery during my treatments. I know I will beat cancer. For 40 years my work profession was focused on after school programs in Del Paso Heights, North Sacramento, and in the City of Sacramento providing children with opportunities to learn about fitness through programs to develop balance, coordination, teamwork, confidence, respect to others and fun. My fitness lifestyle while growing up in Sacramento included boxing, marathon running (Boston in 1984), cycling, Death Ride, summiting Mount Shasta, baseball, softball and when I was done, 15 years of coaching youth sports in my community. My goal in coaching was teaching the fundamentals, fitness and having fun. My coaching experience took me to the high school level where I took a leave in 2012 to focus on my health. I do plan to coach again, when I'm not sure, soon. I became a Alhambra member 30 years ago when it opened, bringing over several racquetball players. I enjoyed the workout equipment and the opportunities to stay fit. I like the changes Cal Fit has made and added more opportunities to stay fit and be successful with your workouts. Keep up the Cal Fit Way. I will always continue to spread the benefits of fitness and how important it is for each of us. We all walk away feeling a little better and happier when leaving Cal Fit. As I always say, "Train for Life!" 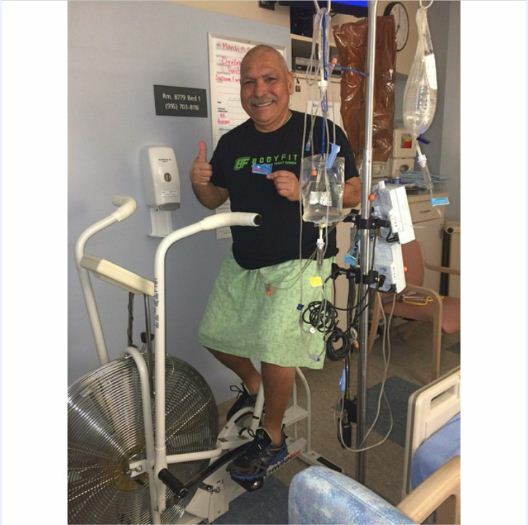 Mr. Contreras, all of your friends at Cal Fit (even the ones you haven’t met yet) are all rooting for you to beat cancer and we hope to see you back at the gym soon.